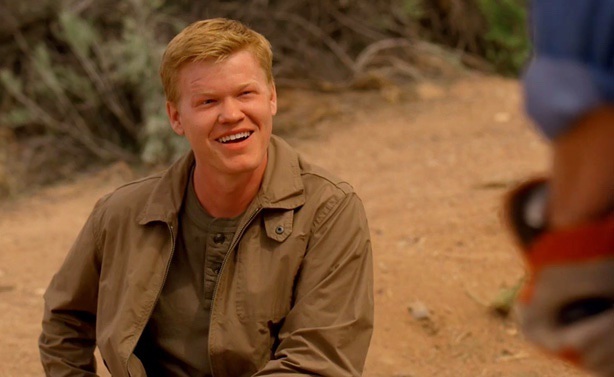 Jesse Plemons from ‘Breaking Bad’ up for Star Wars: Episode VII? The Wrap is running a piece stating that top talent agencies have Jesse Plemons as a top contender in Star Wars: Episode VII. The actor is 25 years old which puts him in a range to play either the older character near 30 or the younger character in his early twenties, according to the casting calls. Of course, like every rumor, that’s even if it is true and accurate. Plemons as the “golly gee” go lucky psychopath in Breaking Bad. What I find interesting about the rumor, if true, is that his general look isn’t altogether unlike Jack O’Connell who was rumored to be up for a part as well. Maybe all this says something about the type of look they’re going for? I would buy these two being brothers if one was cast as the older brother and the other as the younger brother. But both might have been up for the same part. While Plemons is represented by Talentworks, a smaller agency located in Burbank, two well-placed sources within the major agencies have told TheWrap that Plemons is a favorite to land one of the coveted lead roles in the “Star Wars” sequel; a third individual confirmed that Plemons is in the running and a serious contender. Honestly, Plemons kind of looks like what I had imagined Anakin Skywalker would look like as a child years before Episodes I-III went into production. The closer we get to the film, the more likely these rumors are going to start to have more validity as well. Sure, we might get an increase in fakes as well. It is an exciting prospect to imagine the cast is coming together at this point. That said, don’t believe it until StarWars.com announces it. This could very well be true and I will ask around to see what others are saying. I would certainly be interested in seeing Plemons playing something different than what he did in Breaking Bad.